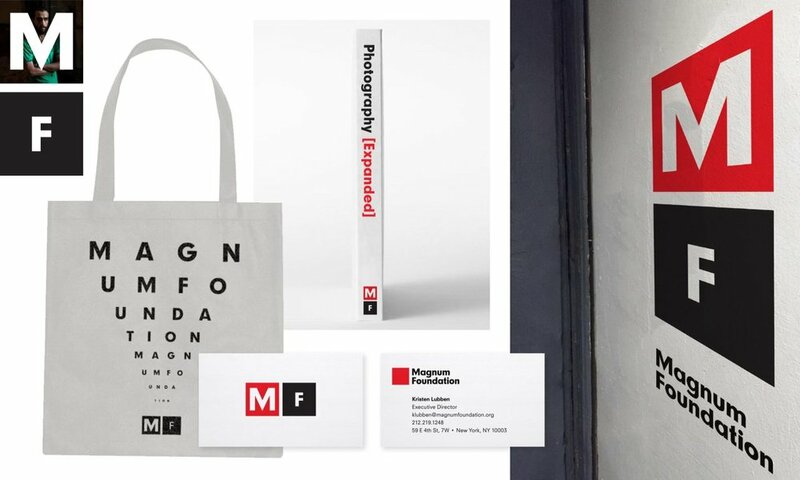 It’s a delicate challenge to give an existing identity a refresh, especially for an institution as impactful and beloved as the Magnum Foundation. As with every refresh we’ve done, we started by combing through what came before. We looked at the visual history of Magnum Foundation, and began to parse out what was distinctly Magnum-esque. The first thing we recognized is the most obvious: the red square. The square is perhaps the most identifiable element, and we knew we had to preserve its legacy. What happens if a commitment is made to the square? What kind of forms and compositions come from this commitment, and how can the consistent shape yield surprise and delight? We looked at artists who were inspired by constraint: from Donald Judd to Bauhaus designers. We found out a square can offer a lifetime’s worth of variations, as long as you’re ok with some restrictions. We paired the mark with approachable, upper-and-lower sans-serif typography—a good companion with the rigid square. We recognized there was another star waiting in the wings: the M. We created a bespoke M that was sharper, more pointed, and ultimately more distinct. It quickly led to another unexpected hero: the MF monogram. The result is an updated Magnum Foundation, built from its legacy and reinvigorated with a cast of supporting elements. We are honored to support Magnum Foundation’s mission, and hope our work helps it grow for many years to come. A lot of Sweetleaf’s “rocket fuel,” especially during our marathon M-drawing days.